Brianda and Jorge DeCastro with DSES instructors Alan Yata and Ron Allin. Immigration has been in the spotlight for many years, and the conversation surrounding immigration has largely had a negative tone, focusing more on what immigrants take versus what they give back. Getting to know Army Ranger Jorge (pronounced like George) DeCastro means getting to know the other side of that conversation. It’s one thing to risk dying for your country, but quite another to risk dying for your adoptive one. DeCastro, 53, was born in Brazil. He emigrated to the United States in 1990 at the age of 24 and moved to New York City. In 1994, Jorge joined the U.S. Army. As he explained this week, when he entered the military, “you could join the armed forces as long as you were a resident alien, and then you could stay in the service up to seven years before you have to make a decision.” The decision being, if you wish to continue in the armed services, you need to become a U.S. citizen. DeCastro became a citizen in 1999. He ultimately served in the Army for 22 years. Admittedly, he didn’t initially join for patriotic reasons. Initially, the reason was more practical. His ex-wife got pregnant and he wanted a stable job so he could support his family. But the Army being the Army, he was tossed a curveball right out of the box. The native Brazilian’s first stop: Fort Richardson, just outside of Anchorage, Alaska. DeCastro was injured during his 3rd tour in Iraq. He also served in Kosovo in 1999. His Iraq tours took place in 2004 (15 mos. ), 2007 (12 mos.) and 2010 (9 mos.). In 2010, he was six months into his tour when his unit fell victim to an IED attack. The impact of the explosion knocked him cold for ten minutes. He recalls nothing but the flash and the explosion. Following the explosion, his unit then came under heavy enemy fire. When DeCastro became conscious, and despite his injury, he reengaged in the fight and led his team to contain the enemy attack. Though he suffered no visible injury, it’s the unseen that is often the cruelest and the most damaging. After the attack, he asked to stay on for the remainder of his tour, despite suffering constant, brutal migraine headaches. He left Iraq three months later upon completion of his tour. It was three months after that where his health really began to deteriorate. The physical issues affected his emotional self. He became more insular, less social, drank more, and experienced serious sleep problems. He was more prone to anger, sadness and depression. He was lately diagnosed with Post Traumatic Stress Disorder (PTSD). It was difficult for his family, particularly his children, to understand the changes. Post-discharge in 2016, DeCastro and his wife Brianda moved from Hawaii to San Jose so he could seek rehabilitative treatment at the VA Palo Alto Polytrauma Network Site (PNS). The PNS is a Defense and Veterans Brain Injury Center (DVBIC) partner site. He sees six different specialists. He doesn’t know how long he can stay in the Bay Area, because the cost of living is so high, but he also doesn’t know if he can afford not to stay, because he’s doing so much better, to the point where he enrolled himself in business school starting last October at the University of Phoenix campus in nearby Santa Clara. What’s really turned things around for DeCastro has been getting out and doing things recreationally. 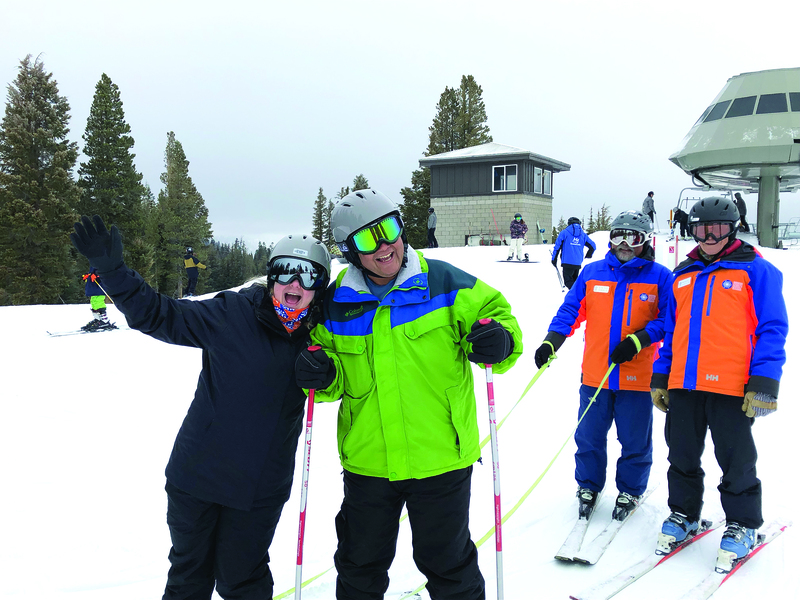 That’s how he discovered Disabled Sports Eastern Sierra, via the VA Palo Alto Medical Center Recreational Therapy Team, which brought him over last winter for Operation Mountain Freedom. Or, have the freedom sometimes to not do anything. And perhaps, to help heal others. When asked what he wished to do with his business degree, DeCastro said he was thinking of starting a non-profit to provide service dogs to veterans, as he has experience training service dogs prior to his injury. His wife Brianda is just finishing her doctorate in psychology. It’s something, he says, the couple may be able to do together. DeCastro has three children. Giliannie (24), Jorge Jr. (21) and Tehani (18). He hopes to return to the Sierra this summer for DSES’s Operation High Altitude. The National Wounded Warrior Center, proposed to be built on the Cerro Coso college campus in Mammoth Lakes, would allow Disabled Sports Eastern Sierra to provide support services to more than 300 veterans and their families each year. The 36-room facility would provide transitional housing designed for veterans, and include areas for recreation, learning and dining. Veterans would also have access to educational and vocational programs, wellness and PTSD management training and therapuetic opportunities. DSES is in the midst of an $18 million capital campaign. See the facing page for details.